The American psychologist Abraham Maslow (1908–1970) was one of the founding fathers of humanistic psychology. Maslow wrote a number of books and also made several important theoretical contributions. He is perhaps best known for his concept of the hierarchy of needs. 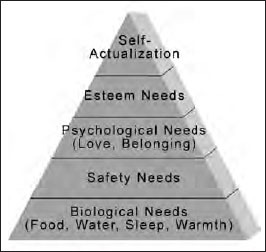 Maslow believed that human psychological needs are multidimensional and that there is no single motivating force to explain all of human behavior. He believed these needs could be organized hierarchically with the most fundamental needs related to biological survival. Once our fundamental biological needs—such as thirst, hunger, and warmth—are met, our needs for safety come into play. Following satisfaction of safety needs, psychological needs for emotional bonds with other people become important. Once those are met, we become concerned with self-esteem and the need to feel recognized and valued in a community. Finally, after all these more basic needs are met, we encounter the need for self actualization, a kind of creative fulfillment of our human potential. This triangle illustrates Maslow’s hierarchy of needs.